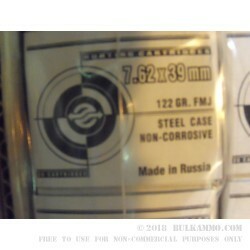 Not all steel cased ammo is created equal, and these 7.62 rounds from Ulyanovsk Cartridge Works are the cream of the crop! 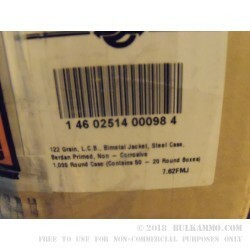 Now you don’t have to compromise between cost and quality with these copper jacketed, steel cased 7.62x39 rounds. The Ulyanovsk Cartridge Works is the premiere facility for manufacturing steel cased ammo, and that quality shows in their care and attention to feeding your AK or SKS. 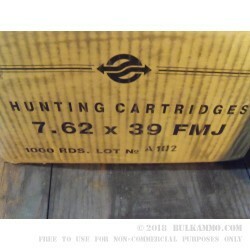 The copper jacketed 122 grain bullet is the perfect choice for a 7.62 rifle, giving these cartridges similar terminal ballistics to the beloved .30-30 round. That makes them perfect for plinking, suitable for small and medium sized game, and they can even be pressed into a home defense role. Plus with 1,000 rounds per case, you’ll have enough ammo on hand for your range trip and to bury a second case in the back yard!